Held at Cahawba Prison, Andersonville, and Florence, SC. Jasper was the son of Joshua L. and Elizabeth Cochran Nichols. 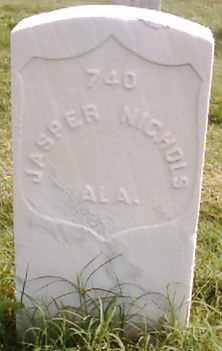 His brother, James F. Nichols also served in this regiment. This certifies that I have carefully examined J.N. Nichols, Private, Company B, First Regiment, Alabama Cavalry, who is now here on furlough from the U.S. General Hospital, Maryland, (Said furlough to expire the 23 inst), and find him unable to travel to said hospital on account of emaciation and general debility, contracted while incarcerated in a rebel prison at Florence, South Carolina. I furthermore decalre my belief that he will not be able to report in person in a less period of time than thirty (30) days from present date. Cemetery records state that he died 6/14/1864, originally buried in the Soldiers Cemetery, Jeffersonville, IN, reinterred New Albany (IN) National Cemetery, Sec. B, grave 740. Picture submitted by Tom Lowe.